"Queen Right" is the expression for a colony that has a good, laying queen. My struggle, it seems. The big hive was queenless yet again. No eggs. No open larvae. Almost all the capped cells were hatched out. The pumpkin patch split was doing fine with their new queen--lots of open larvae, capped larvae, eggs, and plenty of food being put away by this smaller colony. After a chat with the local bee guru, it was decided that I should join the two back together rather than try to re-queen the original hive. Mid-August is not the time to begin anew. So, it was time to put everyone back into one big happy family--except that they were now all estranged relatives. I took the best frames from two hive bodies and put them into one. Then left all the bees to relocate themselves into this smaller house. After dark I sealed them up and transported them(ever so carefully) up to the pumpkin patch. The queen right hive would remain just as it was and the bigger group added to the top. My oversight of the afternoon caused a little dilemma. 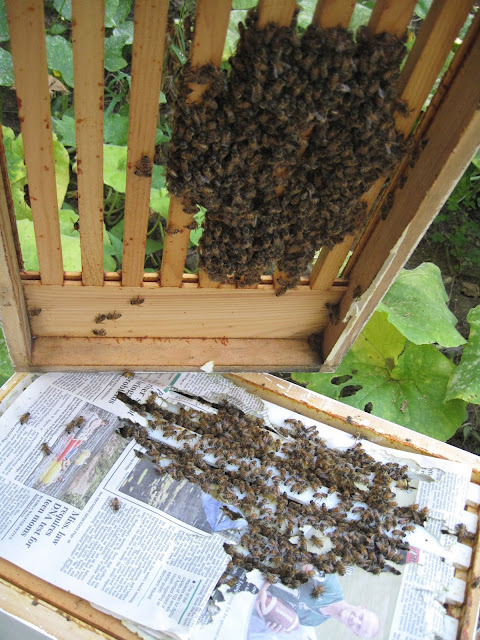 I forgot to remove the slatted board from the bottom of the original hive body, so it had to be left in place between the two colonies. Original hive on top. Why are he bees are grouped in the center? They were all grouped over the passages they had made through the paper below. so crowded--so they don't swarm. In and out through their newspaper doors. With the paper off, I can see lots of bees on all the lower frames. Chewed newspaper on the bottom board. They had also been moving it out and dumping it in front of their home. I helped them by cleaning it all off. 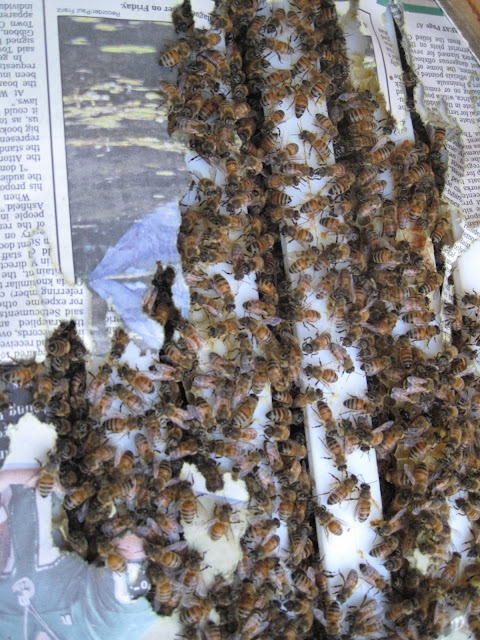 This frame was in the top formerly queenless hive. She had already moved up and had lots of brood going. There is capped brood and the open cells contain big, white larvae.